Below is an interview with Dr. Jillian Drouin, DC, BSc, CSCS regarding kinesiotape and swimming performance. The interview is based off her recent literature synthesis on kinesiotape. 1. What are the possible mechanisms by which Kinesiotape improves performance? According to its creator, Dr. Kenso Kaze, kinesiotape is hypothesized to increase proprioception through constant cutaneous stimulation, to normalize muscle tension, to improve blood and lymph circulation, to strengthen weak muscles and to decrease pain through neurological suppression. These actions are meant to improve tissue healing for injuries; however, if these proposed mechanisms can also be elicited in healthy tissues, then it follows that kinesiotape and swimming performance could be positively affected as these are all physiological properties that lead to optimal performance. 2. 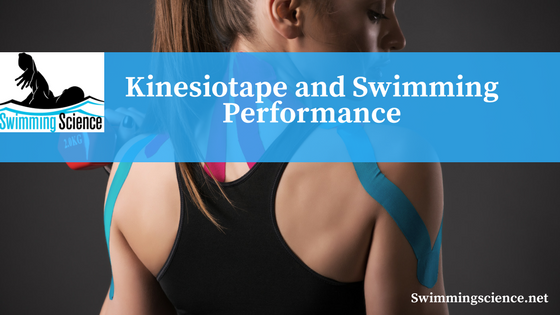 What does the research suggest regarding Kinesiotape and swimming performance? At this time, the research would suggest that Kinesiotape generally does not improve athletic performance in healthy individuals. It also does not appear to decrease or limit athletic performance which could be a significant factor in an athlete’s decision to use this therapeutic intervention during competition while managing a minor injury. Overall, more consistent evidence is needed to draw solid conclusions on the effects of various applications of kinesiotape and on different locations of the body. 3. Does the research vary on the location of the Kinesiotape? The research varies greatly on the location of the kinesiotape application, as well as the type of application (ie. facilitation/inhibition, stretch percentage). There are also large fluctuations in the athletic performance measures utilized in these studies. All of these discrepancies make it difficult to draw strong conclusions on the specific effects of kinesiotape in healthy individuals. The most consistent methodology used studies force production of the quadriceps with a variety of taping vs non-taping protocols to one or more of the quadriceps muscles. Each of these studies concludes there is no statistically significant difference in force production with the kinesiotape application. 4. Does the research vary based on the type of tape used? The research does vary slightly on the brand of kinesiotape used; however, all brands are meant to have the same general composition and thus the same physiological effects on the body. Many studies also use an alternative taping protocol (ex. white athletic tape, non-elastic adhesive tape) to use as a sham or comparison variable for the kinesiotape protocol. 5. If Kinesiotape and swimming improves performance, do you think it should be illegal, like in swimming? If kinesiotape is eventually found to enhance athletic performance in healthy individuals, I personally do not believe it should be banned. It is a generally inexpensive and easily attainable product which is easy to use. It also does not pose a large risk to the health of the user, which is more typically a strong argument for banning a performance-enhancing substance. 6. What research is warranted to determine if Kinesiotape is beneficial for performance? In general, more research is needed with consistent methodology protocols which focus on the same muscle groups, taping protocols and outcome measures.